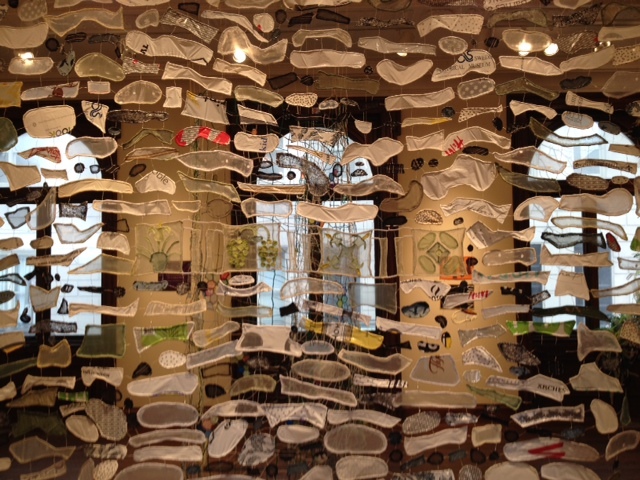 Caroline Lathan-Stiefel: Greenhouse Mix is on view at the Philadelphia Art Alliance March 20 – April 27. CLS: I grew up in Atlanta, GA (born in 1967). My mother was a docent at the High Museum when I was little and so we visited there often. I remember seeing a visiting Calder show when I was probably around 6 or 7 that included his circus and that made a big impact on me. I went home and tried to make my own circus figures. My mother began collecting southern folk art in the 70’s and 80’s, including several pieces by the artist Nellie Mae Rowe. Her work remains very important to me. 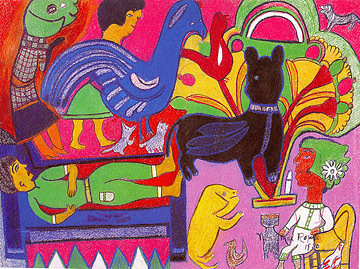 In high school, I was very much influenced by the art environments of outsider artists like Howard Finster. I visited his Paradise Garden in Summerville, GA several times. On one visit, when I was a senior in high school, I knocked on his door and he let me into his studio. He was working on one of his paintings wearing a vest covered in pennies. He told me I could make a drawing on one of his ceiling tiles and so I stood on a chair and added my drawing to all of the other ones that covered his ceiling. After high school, I was a Visual Arts major at Brown University. There, I studied painting, with professor Wendy Edwards. I always used a lot of collage elements in my work and my paintings in my senior year were more like large assemblages or sculptural paintings. I incorporated fabric into the work too. After college, I began to make bas-relief paintings with paper mache and paint. The work was figurative with abstraction creeping in. Eventually I got married to musician and composer Van Stiefel, and we moved to Princeton, NJ so he could get his PhD. While we were there I began a low-residency MFA at the Maine College of Art, which I completed in 2001. 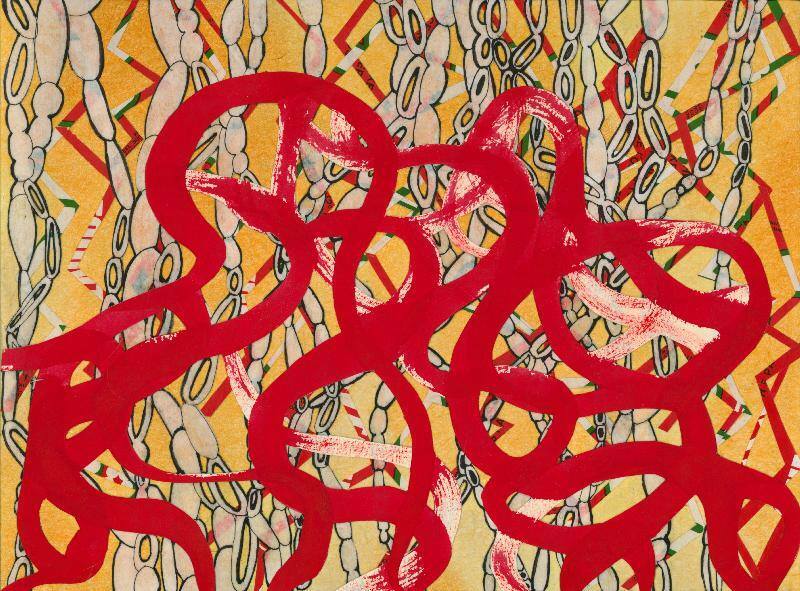 During the first year of grad school, I worked with artist Mira Schor. Mira visited my studio in Princeton several times to give me crits and we visited many galleries and museums in NY together to look at art. Her strong, honest critiques were integral to the development of my work at this point. She advised me to break away from figuration and to delve deeper into the world of abstraction and to let the materials be what they are. During the second year of my MFA program, the artist Jeanne Silverthorne was my advisor. I had started to make a series of marker drawings on notebook paper that were like doodles of systems and was also experimenting with sculptural pieces with fabric. Jeanne suggested that I transform my drawings into three-dimensional sculptures. I then made a small model that combined several of the drawings and proceeded to make a monumental version of the model with fabric, yarn, and pipe cleaners in my Princeton studio. I had also seen an amazing photo of Gaudi’s model for the Sagrada Familia. Because his cathedral was so organic in form, Gaudi created an upside-down stress model that was suspended from the ceiling with strings and weighted with little pouches of buckshot. This image gave me the idea to hang my work from the ceiling with yarn and string and weight it to the floor with fishing weights and to think about lightness and gravity in my work. CLS: My father took our family on many hikes throughout Georgia and the mountains of North Carolina when I was a kid. I loved the feeling of being surrounded by woods. Sometimes he found hikes in outdated books, and we had to literally bushwack our way through the trail. This was a bit scary, but I also secretly liked it. My interest in plants and botany has definitely become stronger as I have gotten older. Living near Longwood Gardens in Kennett Square is a plus and I have also gained insight into plants and gardening from my mother-in-law, artist Rosemary Stiefel and from my fellow Upland art teacher and artist, Terry Anderson, both of whom have exceedingly green thumbs. I have gone from killing plants within a week to actually being able to keep them alive for a year and have started seasonal gardening with my husband and kids. In terms of using real plants and leaves in my work, I remember seeing artists do this when I was at Brown when the Harrisons, pioneers of the eco-art movement, visited the department. My friend, curator, Sue Spaid curated a show and wrote a book called Green Acres, which has been influential to me. In general, I am interested in using materials from my daily life in my work. I began to use the pipe cleaners because I was using them in my role as an art teacher and I save my shopping bags so I can incorporate them into the sculptures. Plants are now part of my daily life as well. …being an artist is…an ongoing process with many challenges and the striving to meet those challenges. I find that the moment I finally finish putting up a show, I might feel good about it for a moment, or even a few weeks, but then I am already on to the next project and facing new challenges. I really enjoy labor-intensive work and have to work everyday, even if it is only for a couple of hours after a day of teaching. I suppose being able to work everyday on my art, while also being a teacher and a mom to two children, makes me feel a sense of pride, but I know most people do the same kind of balancing act these days… I would like viewers to not only have a visual experience, but also an immersive one—one in which they would feel physically affected by the work because of the way it surrounds them. I also encourage viewers to look through different sections of the work to see new and unexpected views of the different layers. I hope they will be surprised by what they see. CLS: A few years ago I took a field trip with students from my school to Bartram Gardens in Philadelphia. I had never been there before, but I had heard the name Bartram because my father had taken our family on hikes on the Bartram Trail when I was a child. I didn’t realize then, but the trail was named for William, John Bartram’s son. In addition to the gardens and strange proximity of the idyllic property to large oil storage tanks across the river, I was struck by the architecture–a very unusual-looking stone house and a smaller greenhouse that included a carved relief of plant forms. I enjoyed studying different plant forms and researching Bartram’s role as America’s first botanist. I would like to thank the staff of the PAA, especially Melissa Caldwell and Mat Tomezsko, for their help with this show, and the Coby Foundation for their aid in funding the show. To read the full interview by guest blogger Deborah Anne Krieger, click here. Guest blogger Deborah Krieger interviewed Samuel Cusumano, whose interactive electronic projects will be on view at the PAA from March 20th through April 27th, about his current exhibition, practice, and fascination with sound and systems. 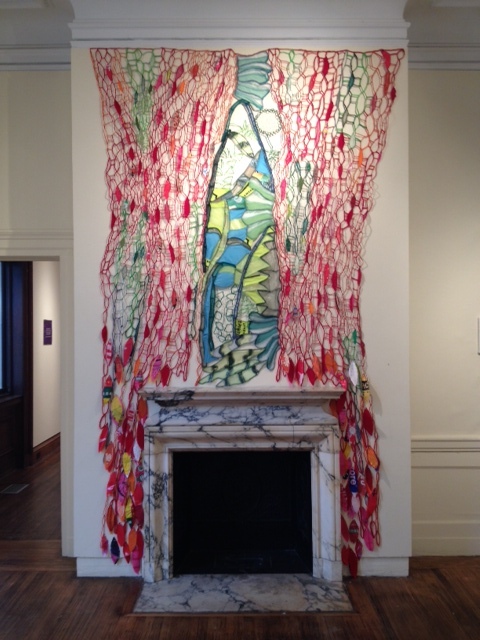 Deborah blogs about the Philadelphia art scene and beyond at I On the Arts. 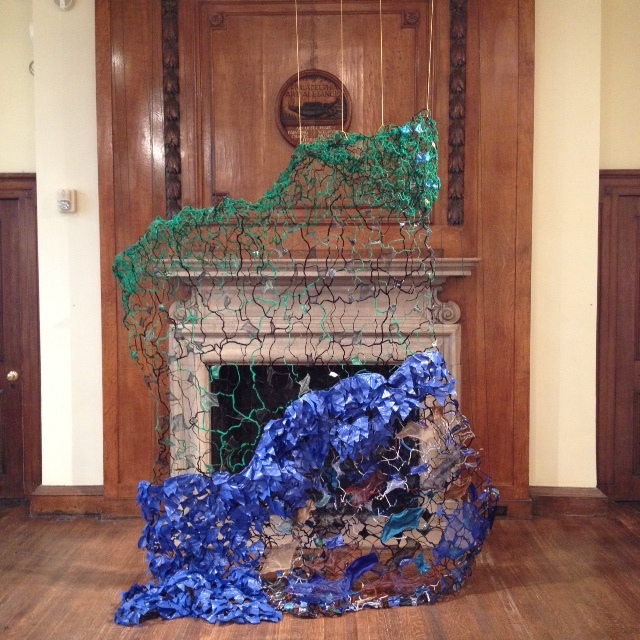 Deborah Krieger is a Swarthmore College Art History student and emerging art writer and curator. I On the Arts: Can you describe your projects, in general and for the PAA show? Samuel Cusumano: I am an Engineer for the Arts. The first will be Biodata Sonification, where I present two tropical plants fitted with custom electronics, which produce a changing stream of music based on fluctuating galvanic conductance across each plant’s leaf. Along with the plants, a theremin will be featured, which is a musical instrument that is played by moving your hand near an antenna. 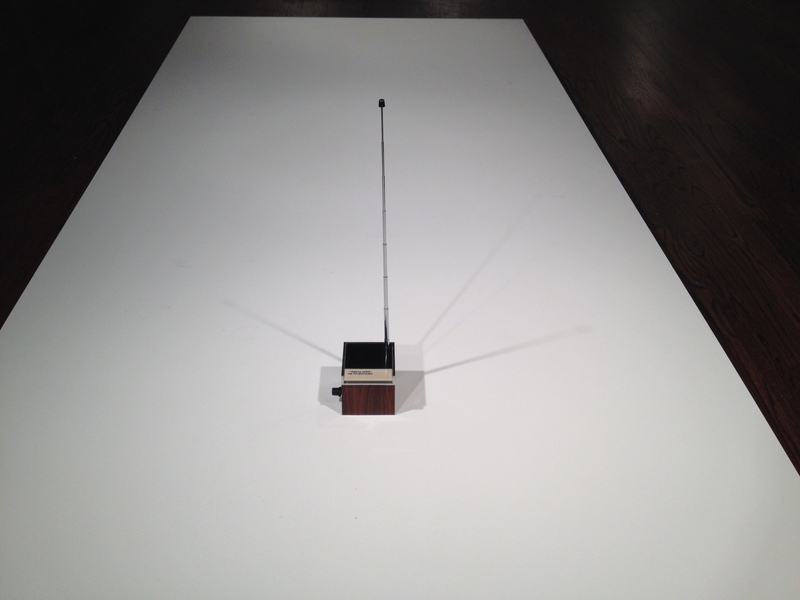 Without touching the antenna, the theremin functions by radio field interactions and is presented along with the tropical plants that also react to human presence. The second exhibit will be Modification, where a variety of modified children’s toys and musical instruments will be presented both on display and for interaction. Guests will be invited to play with and explore the devices and will be encouraged to play together and create novel compositions. 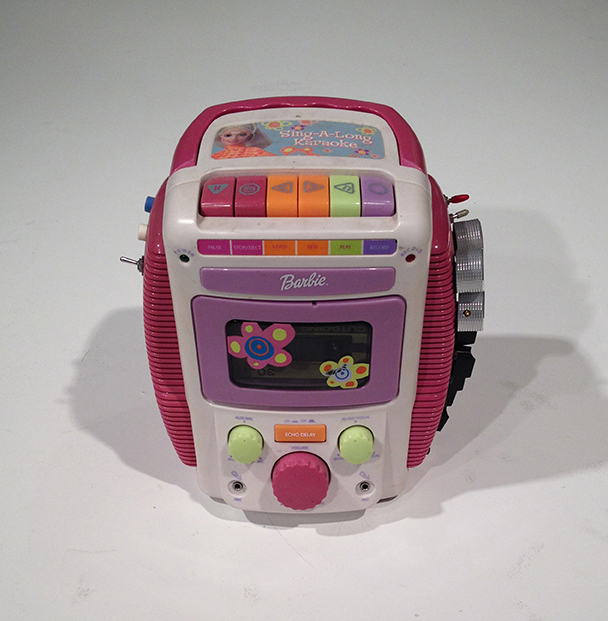 On display will be Barbie Karaoke machines, the Speak and Spell, Casio SK-1 and SK-5, and an array of custom circuits. 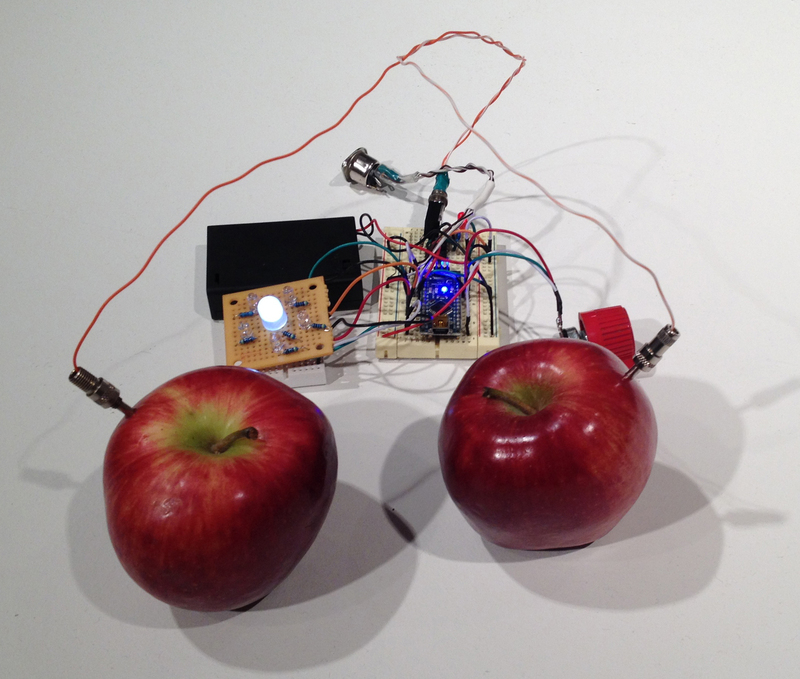 The third exhibit is a presentation of the Apple Interface, where guests are invited to sit at a table, don headphones, and touch two apples, which will produce a series of musical notes in reaction to the user’s grip. This exciting interface is augmented with subwoofer seats from SubPac and beautiful soundscapes from Data Garden. The fourth exhibit will be Room of Sounds. Samples, performances, demonstrations, explorations, and archives will be played back for listeners and guests…At times beautiful and melodic, and at times harsh and gritty, guests are invited to listen and find their own patterns in the noise. IOtA: Has sound always been your medium? SC: I have acted as a sound engineer and recording artist for the past 15 years, providing a modest PA setup to local psychfolk [sic] and traveling artists in cozy bookstores and churches. Musically, I have produced a powerful album Sequence of Prophets with Niagara Falls, which features circuit bent SK5 keyboard as a variety of waves, winds, washes, hot leads, and deep bass. I have performed regionally as Electricity for Progress, where I present and explain different modified devices and perform a, sometimes noisy, demonstration (with commentary). I also work with the media organization Data Garden, where we work with Biodata Sonification systems, presenting artists and biologists with streaming data from plants. Our MIDI Sprout project places electrodes onto the leaves of plants and graphs changes in galvanic conductance across the surface of the leaf as MIDI notes that can be played on a computer or synthesizer. IOtA: What is the most satisfying part of your practice? SC: It has been amazing working with plants and presenting my Biodata Sonification systems to the public. Through powerful daytime outdoor exhibitions, we have been able to show, explain, and entertain hundreds of passers-by through sounds and questions. IOtA: What is the most frustrating part of your practice? SC: In the Biodata installations, people often walk up to the plants with the desire to touch them. This always frustrates me, as the most amazing aspect of the Biodata installation lies in the way that plants and humans interact without touching. For patient guests who linger and listen as others come and go, some of the subtle dynamics of the sonification process can be heard, and the listener can begin to decode some of the complex information presented. IOtA: What is your artistic background? What about your musical and scientific background? SC: When I was a child, I always wanted to understand how machines and systems worked. I would build and dismantle anything that I could take a screwdriver to. I began working with simple electronics and computers, which became a huge asset for repairing and rescuing aging machines. From working with musicians, I began repairing guitar effects and old analog synthesizers. I was introduced to circuit bending and modifying toys and small keyboards, which opened my mind to a whole array of modular synthesizer and DIY electronics organizations. My devices begin with opportunity and inspiration. Conversation and crazy ideas can sometimes lead to amazing systems. For example, earlier last year I worked with Little Baby’s Ice Cream on a device that allows users to play music while they eat an ice cream cone. Music for Ice Cream presented a duet where friends eating ice cream cones fitted with my interactive “cone-troller” could produce generative music. IOtA: What do you hope people will take away from your craft? SC: My goal is to inspire creative questioning. By presenting modified, noisy devices to the public, I create an atmosphere of free play and allow users to explore and interact with the modified devices and with each other. I love discussing my devices and machines with guests, understanding their perceptions, and discussing questions.